Consumers bought fitness bands and smartwatches in droves, but many of those devices have ended up in sock drawers due to a broken user experience. Wearables are starting to evolve past smartwatches into shirts, pants, tattoos, hats, glasses, shoes, sporting goods, and more, as sensor technology improves to eliminate the need for wrist worn devices. The value of wearable technology is not in the hardware – which should be unobtrusive and almost automatic – but in the data that is collected from the devices. Consumers are experiencing trouble trying to make sense of it all. 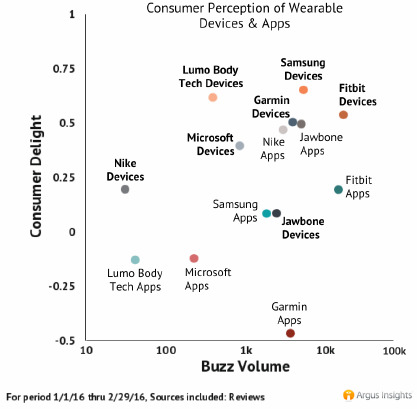 According to Argus Insights a new report on Wearables shows the disconnect between the user experience, expectation of usefulness, and the app. For example, Jawbone Up is leading ‘delight’ as a great ‘all in one app,’ but at the same time users express discontent with the Jawbone bands. Argus Insights says that mindshare predicts demand. Its software platform and reports provide comprehensive visibility across a given market, showing detailed analysis of the specific attributes that determine what is delighting and disappointing actual consumers by brand and by product. The platform is data-agnostic, but typical data sources include review data from leading retailers (star reviews) and a variety of social data (Twitter, Instagram, etc.). The new report shows that both Nike and Jawbone apps are earning praise and relatively higher delight scores while Fitbit, Samsung and other apps are consistently seeing low consumer satisfaction. The major areas of consumer discontent include trouble syncing data, apps crashing and frustration with installation. The report also shows that consumers are happiest with the fitness, calorie tracker and heart rate monitoring information available from the wearable apps. Consumers are enjoying Nike and Jawbone apps, though complaints of a fragmented app ecosystem span across consumer feedback. Users are looking to have all the information they want and need in one place, so integration among apps is very much appreciated. Jawbone Up is leading delight as users dub it a “great all in one app,” and are especially impressed with the accessible insights from the SmartCoach. The ability to keep track of food intake, calories, sleep patterns, steps, heart rate and even integrate with other apps to track different exercises all contribute to the high rate of consumer approval. While Nike is no longer a big player in Wearable hardware, smartwatch users like to use the Nike+ Running app to track their runs but are frustrated that Nike+ Running does not sync with other apps. While delight for Nike and Jawbone Apps is on the rise, Fitbit, Samsung and other apps are seeing consistently low consumer satisfaction.